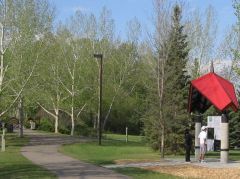 The mandate of the Central Alberta Regional Trails Society (CARTS) is to promote and foster trail development in Central Alberta. For several years now, CARTS has focussed its efforts on developing the Trans Canada Trail within Central Alberta. Working with dedicated volunteers, municipalities, Alberta TrailNet (ATN - the provincial trails organization) and Trans Canada Trail Foundation (the national trails organization) we have been making progress. This report will provide an outline of progress to date and provide information on the society's plans for the coming year. - One of the first steps in the process of building TCT in Alberta was to get Central Alberta on the TCT map. Several years ago, the planned route for the TCT did not take in most of the communities in this region. CARTS did not believe that it was a wise idea for Canada's national trail system to bypass one of the busiest corridors in the province. CARTS also believed that Central Albertans had a strong desire to have and use trails and would welcome a trail that could link their communities. - Through CARTS, Central Alberta's municipalities have been working together on trails. About three years ago, the map for the TCT was changed in Alberta to include a trail linking communities from Penhold to Wetaskiwin. Much of the trail registered as TCT was done so on road rights-of-way with the intention of moving it to an off-road trail. To this end, we have had meetings with members of Alberta Transportation, MLAs, municipal councillors, and members of ATN and TCT. To date, most of the trails between communities and within communities along this corridor have been registered as TCT. - Registering these trails was vital in order to obtain funding available from the TCT Foundation and ATN. Each organization can contribute up to twenty percent of the costs of building a trail or 40 percent in total. - Once Central Alberta had a registered section of TCT, we asked the TCT Foundation to fund a TCT coordinator position to assist our small band of volunteers in moving along the process. For the past two years, Derry Armstrong has been working with CARTS to help build the TCT in Alberta. - Bridges: In order to link communities within Central Alberta, several bridges will be necessary. The two key bridges are located between Blackfalds and Red Deer over the Blindman River and in Ponoka over the Battle River. CARTS helped municipalities in these regions apply for and receive funding from the TCT Foundation for the engineering of both of these bridges and have helped them apply for and receive funding for a large part of the construction costs. We also contacted the Canadian military engineers to seek their assistance. - Building Canada Grant Fund: Lacombe County submitted an application to support construction of the TCT from the Blindman River to Morningside ($2.4 million). Unfortunately, the County has been advised that trails are not eligible to be funded under this grant program. Red Deer County also has an application in. Blindman River Bridge: CARTS will continue to work with the County of Lacombe, Town of Lacombe, Town of Blackfalds, and the County of Red Deer on building this bridge and linking trails. It is slated for construction for this winter, with the bridge decking going on in the spring with the help of the Canadian Military. Battle River Bridge: The bridge has been ordered and the design work is being done. A trail development coordinator has been hired. The Town of Ponoka is planning to build a significant amount of trail this season both inside the town and to connect into Ponoka County. They are applying for a federal grant to enable them to build trail all the way to Lacombe County. Brad Watson said that the support of CARTS has been appreciated and of significant benefit in contributing to the success of the work accomplished to date. Penhold-Springbrook Trail: Red Deer County is planning to build this trail within the next year. CARTS hopes to assist them with funding applications and by providing input on other trails they are looking at building. Boots Across Canada: Keen Canada (www.keencanada.ca) has a promotion whereby they will pay $5 for every pair of boots (or shoes, or sandals) photographed on Canadian trails and uploaded to their website. Maximum 10 pairs of boots per photo. We're asking Central Albertans to take pictures and send them to CARTS at info@centralalbertatrails.org. We'll upload the photo and keep track of how much money is raised here in Central Alberta. The program runs until the end of October. 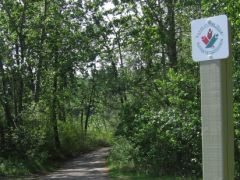 New Federal Trail Grant Program: A new federal program will provide trails funding through the Canadian Trails Federation. We have finally received information on the grant process and the deadline is June 26. CARTS is working to help Lacombe County get an application in to cover the remaining costs for the Blindman River Bridge. We're hoping other Central Alberta communities will also apply for funding and we are here to assist if they need it. Promotion of Trails: Several Central Alberta communities are planning events this summer and fall to promote trails. CARTS will continue to encourage and promote such events and is planning a community trails walk in the fall. More Trails in the Future: CARTS has been working with several Central Alberta municipalities on their plans to establish more trails in this area. We hope to have some positive announcements in the near future. Resolution: CARTS helped to coordinate Central Alberta communities in bringing forth a resolution regarding trails to the AUMA Convention which will take place in November 2009. The jointly-sponsored resolution asks the provincial government and Alberta Transportation to consider non-motorized modes of transport when they are building or upgrading roads and highways. CARTS Website: In the past couple of years, Paul Pettypiece, the current Vice-President of CARTS has developed an excellent website to help promote and inform Central Albertans about trails. A Note of Thanks: CARTS appreciates the support of the Trans Canada Trail Foundation in moving Central Alberta trails forward. Our TCT Coordinator, Derry Armstrong, has been invaluable in this process. We also appreciate the support of Alberta TrailNet. CARTS would not exist without the support of dedicated Central Alberta volunteers and the support of the municipalities in Central Alberta. Together we can build something special. CARTS Current Community Participants: City of Red Deer, Counties of Red Deer, Lacombe and Ponoka, Towns of Penhold, Blackfalds, Lacombe, Ponoka and Sylvan Lake, and Hamlet of Springbrook.